Welcome, as the 2013-2014 fall season begins and the orchestra year is in full swing! This is my seventh year on the Volunteer Council and I am honored to serve as your president. It is a privilege to represent dedicated and committed volunteers across the nation. I am always impressed by the volunteers who come to Conference. Your vision, generosity, knowledge and foresight continue to build strong foundations for orchestras. No matter how small or big the task, the volunteer is there to do his or her part to keep the music alive. It is fun to work together, meet challenges, and achieve great things as volunteers. Last spring, the wonderful work of volunteers took center stage, as the League of American Orchestras presented the Volunteer Council with the Gold Baton, the League’s highest honor, given annually, for distinguished service to America’s orchestras. My goal this year is to continue to showcase the symphony volunteer. Seattle is hosting the 2014 National Conference June 4-6, with pre-Conference sessions beginning June 3rd. Conference offers great training opportunities, networking time, and of course wonderful music, so please plan now to send a delegate. Conference attendees return to their organizations with new ideas and motivation. Volunteer delegates gain knowledge and insight through the projects presented at Conference, learning from national speakers and networking with other volunteers who share the same goals and challenges. Thank you for your leadership, and I look forward to serving alongside each of you. May your year be filled with successes! 2014 Gold Book Online Awards – Submissions Closed! Thank you to all those who submitted projects to this year’s Gold Book Online. The Volunteer Council continues to be impressed by the projects that come in. We look forward to reviewing this year’s offerings and discussing them at our November meeting. Both Gold Book Awards and Roundtables winners will be notified in late November/early December, and will be asked to present their projects at the League of American Orchestras National Conference in Seattle June 4-6, 2014. The winning projects will be announced in our Winter issue of Volunteer Notes. For those of you who did not submit projects this year, we hope that you will in the future. Gold Book Online is the national resource of successful volunteer projects. Every submission received is part of the Gold Book Online library, which contains a brief description of successful projects dating back to 2005. Gold Book Online facilitates easy networking and information sharing opportunities between volunteer organizations. Take a moment to browse your colleague’s projects for new ideas, and start thinking about what projects you might want to share next year. The League of American Orchestra’s Volunteer Council recognizes and is grateful for all of our beloved sustainers, Council members and others who participated in the 50th Anniversary gift to the League. Every pledge has been received and acknowledged. 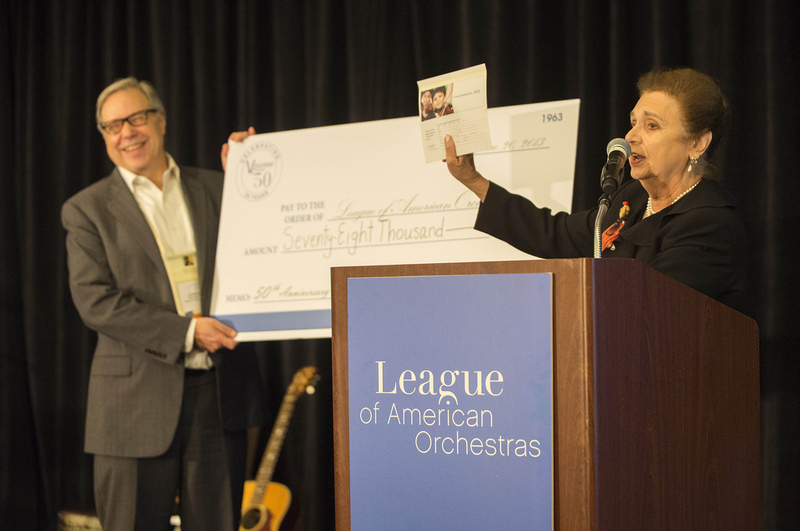 The League of American Orchestra’s Volunteer Council exceeded the established goal of a $50,000.00 gift, and our contribution of $80,532.50 was presented to the League at Conference in St. Louis this past June. This amount represents 161% of our original goal. Your generosity supports the ongoing educational endeavors of the League, and we are sincerely grateful for your continued advocacy of these endeavors and symphonic music. Setting up an archive for your organization is an important task and one that we don’t all take seriously enough. 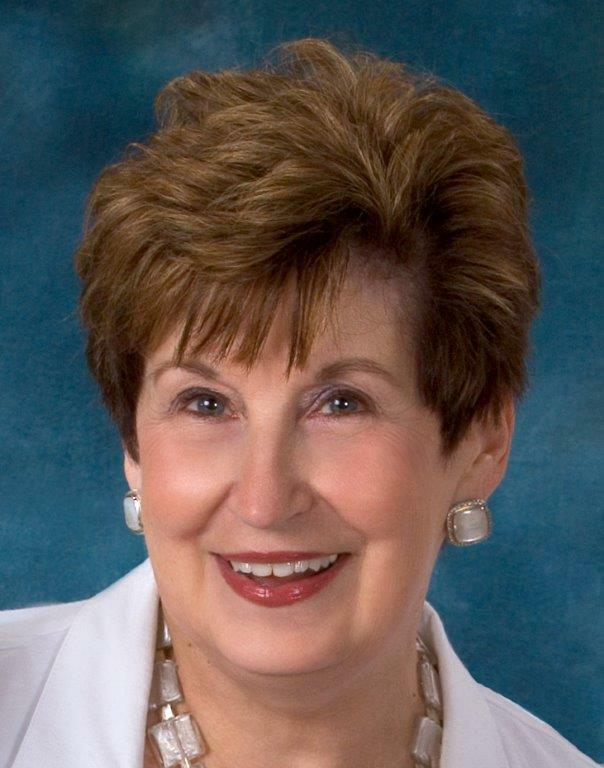 At Conference in June, your newsletter editor had the good fortune to chat with Joan French, archivist for the Peoria Symphony Guild, the Peoria Symphony Orchestra, and the Peoria Symphony Foundation. This is a volunteer position and one which Joan especially enjoys. I asked her to write up something about her role for Volunteer Notes. The history of any organization is important. Past records can be used for reference and planning for the future. Keeping one’s history is important. Exhibits cannot be created without historical documents to support the history. As a history major in college it struck me during service on the Symphony board that we were not doing a good job of saving our records. Filling the seats and meeting budget was always a first priority, so it was only in later years that I offered to establish an archive for the Guild, Orchestra, and Foundation. After researching several orchestras by phone and a private interview with the Chicago Symphony archivist, it became apparent that partnering with Bradley University was our best option. They already held archives for other groups and welcomed our small collection. We were given space in the Bradley Music Library, buying our own shelves and acid-free boxes and filing folders. Guild volunteers staff our archives, but we are guided by the professional archival staff at Bradley. They have been wonderful and most patient. The costs are split between the Orchestra and Guild. We discovered that one of our members had been saving everything about the Symphony for 50 years. She wasn’t ready to part with it, however, so a Letter of Intent was suggested by the chair of the Bradley Archives. When this member passed away, 25 boxes came our way. We are still sorting through them -- a very rich addition to our archives. The volunteers meet once a month to sort and file. A schedule of collecting materials has been set up with office staff and Guild board members. We also do oral histories, working with our local NPR radio station. At present, we have 8 or 9 of these now, representing Orchestra and Guild projects. 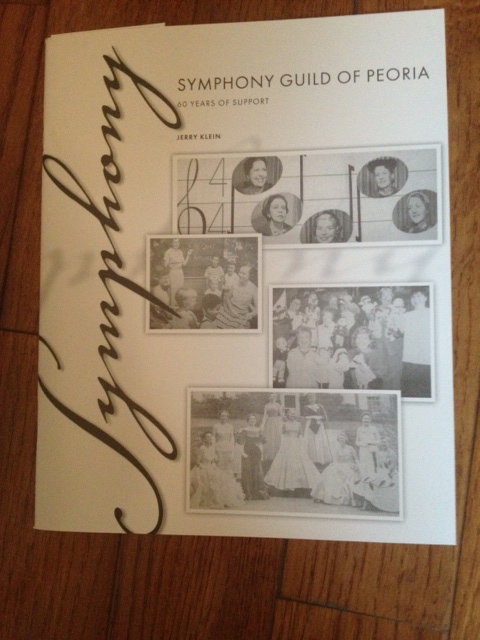 The most ambitious project has been the publishing of Symphony Guild of Peoria, 60 Years of Support, to honor the 60th Anniversary of the Guild. We could not have done it without our archives as a written and pictorial resource. We are selling copies for $5.00 with the funds going to support the Guild’s five educational projects, serving members of the community from kindergarten to adult ages. Editor’s Note: In addition to your local University’s archives, consider working with your local historical society to house your archives. They may be able to provide you with space as well as acid-free boxes in which to store your materials and archival guidance. If you would like to contact Joan and learn more about the Peoria Symphony Archives, you may call her at 309 682 1357. Join the Conversation and participate in our online discussion group specifically for orchestra volunteers on League360. This is a great way for you to be in touch, share ideas, and ask questions of your colleagues from across the country. If you already have a username and password to access The Hub, then you can use this same login to access League360. Once you are logged in click on “Groups,” then search for "Volunteers," select that group and then click on "Join Group." The more people who join and participate in this group the more valuable it becomes! Encourage everyone in your volunteer association to take advantage of this powerful resource. Beginning discussions include education concerts and fund-raising ideas. You can start a new discussion or add to an existing one. Sights: Our Conference hotel will be the newly renovated Westin in downtown Seattle. Located within walking distance of the Pike Place Market, the Space Needle, and Seattle Art Museum, the Westin (and downtown Seattle) offers spectacular views of the Puget Sound and Mt. Rainier. Sounds: The Seattle Symphony will perform for you and an audience of their peers from across North America. Under the baton of Ludovic Morlot, the symphony promises to take you on an extraordinary musical journey, one you most likely will never forget. Tastes and Smells: Great cuisine opportunities abound, from the fine dining establishments of nationally-recognized chefs to eclectic, casual eateries. This year, the Volunteer Council has already started planning an incomparable group of Dine-Around restaurants to ensure a great networking experience for all volunteer delegates. Touches: Shake hands with volunteers from the East Coast to the West Coast and all points in between. In the communality of purpose, handshakes can become hugs as friendships blossom between volunteers with a passion for symphony. Intellect: Learn how to attract and retain members successfully. Increase your fundraising revenues. Grow your members into leadership powerhouses. Delve into the complexities behind better governance and better organizational structure. Add to your repertoire of community engagement and education ideas. This, and more, awaits you in the Seattle Conference Volunteer Sessions, as we present essential instructional programming and award-winning projects from across the nation. Now is the time to make sure you and your volunteer organization are budgeting to attend the 2014 Conference. Online registration and hotel reservations will be open in February 2014. It is not too early to start making your plans today for this exciting and rewarding National Conference. And, please ensure that Conference is on your orchestra staff and board’s radar screen – something great awaits everyone!